What struck me when I first arrived in Cahokia was the incredible stink. I had been called to serve in the Missouri-Independence Mission, but my first area, Plattsmouth, Nebraska, was far from any of the historic church locations I had expected to to see when I got my call. Now, near the end of 1973, I had been transferred to my second location. I would spend my first winter as a missionary in smelly Cahokia, Illinois; as far from Far West or Independence or Adam-Ondi-Ahman as a guy could possibly get. 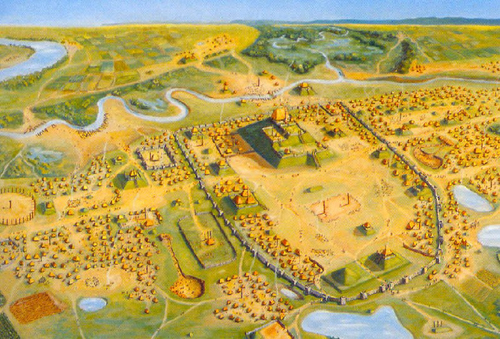 The small town of Cahokia was located next to East St. Louis on the Illinois side of the Mississippi river, famous for its slaughterhouses. The smell of bovine death and gore hovered in the air long after slaughtering had ceased for the day, floating up and mixing with the rancid smoke spewed from the smokestacks of the nearby Monsanto chemical plant, then slowly settling down over the hapless town of Cahokia to choke its residents while they slept. "It's something you just get used to," my new companion told me. 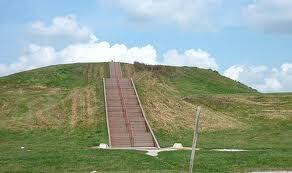 Had I known then what I know now, I would have been delighted to find myself in Cahokia instead of dreading it. As it turns out, I had landed smack dab in the middle of Book of Mormon Central and never even knew it. 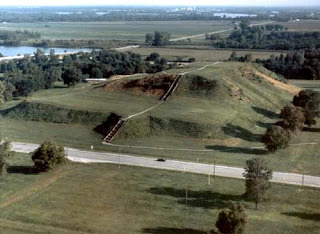 My companion told me that Cahokia's claim to fame was some mysterious Indian mounds, humongous earthworks built up by long departed Illinois Indians for reasons no one remembers. We never did get around to seeing those mounds because (1) with the first November snow flurries arriving, it didn't seem an opportune time for sightseeing, and (2) I wasn't really interested. Who cared about some piles of dirt left behind by a tribe of long-dead Indians? American Indian ruins didn't interest me, but if you really wanted to light me up in those days, just get me talking about Book of Mormon geography, which, as everyone knows, took place in south and central America. From my seminary days on, I had gobbled up everything I could learn about ancient Meso-America, and had even entertained the idea of studying to become an archaeologist so I could uncover additional evidence that the people of Central and South America were descendants of the Nephites and Lamanites. My great dream was to one day visit the temple ruins at Chichen Itza and Teotihuacan. Had I paid closer attention to the words of Joseph Smith when he spoke of the ancient inhabitants of this continent, I would have noticed that he said this continent, not the one below it. If I wanted to see real evidence of Book of Mormon archaeology, I would have been looking in the wrong place chasing after the Mayans and the Aztecs. As it turns out, some of the best evidence on earth for what I was interested in was right there on the outskirts of Cahokia. And I just blew it off. I was not alone in not having figured that out. 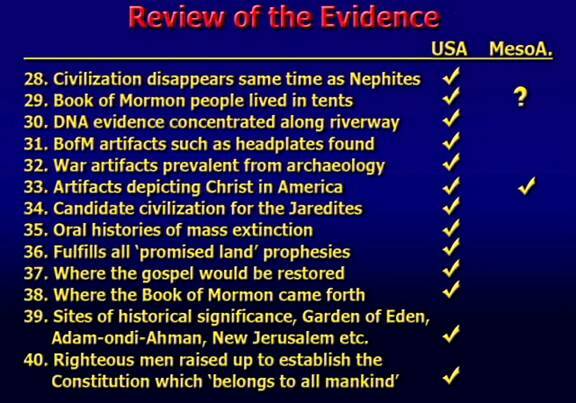 The problem with trying to place cities described in the Book of Mormon anywhere in North America is that there had always seemed to be no evidence whatsoever that advanced civilizations ever existed here. Until fairly recently, that is. As I learned watching the documentary Lost Civilizations of North America, even most historians were unaware of the -pardon my pun- mounds of evidence right under their noses. 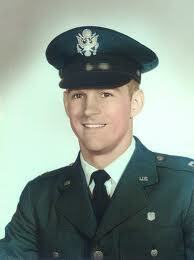 Such was the case with Dr. Roger Kennedy. He was a professor of American history who was shocked to learn, in 1991, that massive ancient city remains were known to exist all over North America. This guy was the director of the Smithsonian National Museum of American History, and he was just finding out. I think you and I can be excused for not having heard. Interviewed for Lost Civilizations, Dr. Kennedy says, "Very, very few of us were conscious of the immensity of Monk's Mound at Cahokia which is bigger in its footprint than the great pyramid at Giza. We didn't know that." Evidence of huge cities with advanced architecture was once abundant from New York and the Great Lakes area, down through Ohio, Illinois, Missouri, Tennessee, Georgia, and points in between. "It's what I call 'hidden cities,' " says professor Kennedy, "I use the term because these were very big places. 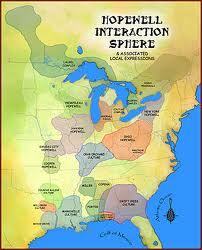 There were more people, we now know, in Cahokia across from St. Louis, than there were in London or Rome. There were major population centers in what now are Nashville, Cincinnati, Pittsburgh, and St. Louis. There were tens of thousands of architectural consequences that are now hidden behind our junk and our architectural achievements." 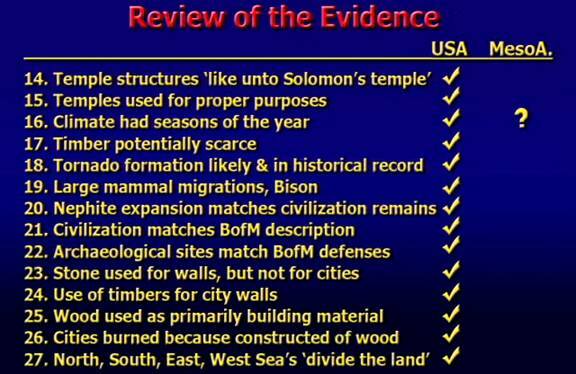 Lost Civilizations of North America (you can watch the trailer here) is not a film about Book of Mormon evidence. The makers of the documentary are more interested in discovering why it is that modern Native Americans have had their heritage kept from them, and how all this became lost to history. How is it that these "world class achievements" in the words of Professor Alice Kehoe, which were quite commonly known of two hundred years ago, became so thoroughly forgotten? To colonial Americans, these structures were commonplace. They were literally everywhere. But they didn't stay in place forever. A farmer faced with a ten foot rock wall in the middle of his claim is either going to have to plow around it or take it down. Most took them down. 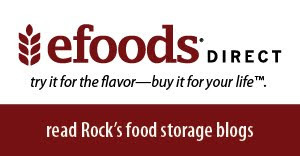 Farmers were uncovering enough arrowheads as they plowed the land to fill bushel baskets, but where archaeologists would see evidence of a massive battle, the farmer saw only a never-ending nuisance. 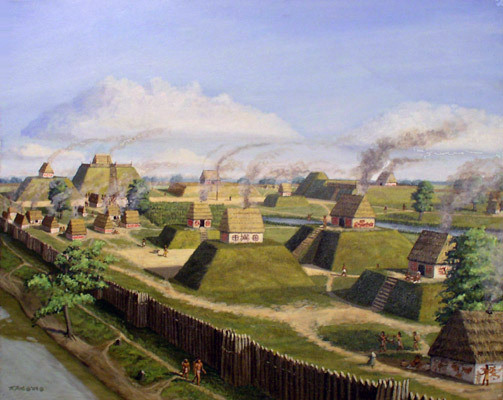 In some instances, as happened repeatedly in what is now St. Louis, small treasures or artifacts were found buried near or within these mounds, which resulted in entire communities coming together to level the mounds in hopes of finding more. In other cases, deliberate and wanton destruction of structures took place for no reason other than the conviction that nothing good could have come from the Indians. From an estimated 20-30,000 mounds and structures known to be in existence in George Washington's day, we have the remains of only about 1100 left. The largest known plot of mounds and roads survives today only because the area was preserved within a golf course at Newark, Ohio. On my one and only visit to the Smithsonian Museum, I was surprised to learn that there is a ton of stuff at the Smithsonian that no one has yet gotten around to examining and cataloging. The basement of the Smithsonian actually does resemble, to some degree, that fictional government warehouse seen at the end of Raiders of the Lost Ark. There exist unopened crates that no one knows the contents of. This was the case with most of the evidence of those large North American cities. Volumes of maps, descriptions, sketches, artifacts, and even hundreds of scrolls containing pre-columbian writing were simply lying around unexamined. And not just at the Smithsonian. According to Wayne May, publisher of Ancient American Magazine, "Every museum, small or big, has a great quantity of stuff that is boxed up that hasn't seen the light of day for literally hundreds of years." Modern archaeologists examining the sites of these ancient cities attribute them to a civilization known as the Hopewell Indians which covered a large swath of the interior of North america. It's important to note that the Hopewells were not one particular tribe. The name "Hopewell" derives from a farm which was the site of an early archaeological dig. What is known as the Hopewell Tradition embraces an entire, broad Native American culture, which takes in what are presumed to be the ancestors of a large number of modern tribes. These people appear to overlap with those of the Algonquins, another broad category containing the Arapaho, Blackfeet, Cheyenne, Delawares, Mohican, M'ik Mak, Shawnee, Ojibwa, and a score of other lesser-known tribes. Some of the earliest Christian immigrants to America took seriously the biblical mandate to treat others as they themselves would want to be treated. To them, the doctrine of Christ meant reaching out to others in love, and that included especially the "savage brutes" they found on these shores. Indians and white men living together in a spirit of respectful cooperation is the tradition we inherit from our pilgrim forbears. America, to the true Christian, was destined to become the shining city on a hill, beckoning other nations to profit by its example of living by the golden rule. But all sweet fruit eventually turns to rot, and by the 19th century, the once pure doctrine of American Exceptionalism came to mean "everybody else better get the hell out of our way." A new doctrine corrupted that of the shining example: Manifest Destiny, which claimed that it was God's will that the white Christian dominate the continent. Certain people were superior, and certain others were inferior. That's just the way God manifested His will. The destiny of the Americans was to conquer and prevail, and the destiny of others was to humbly submit. The native inhabitants of the land were no longer seen as God's children deserving our succor, but mere savages who stood in the way of the national land grab. It was now perfectly okay to push them out of the way, or even exterminate them if they resisted. This push toward genocide was enthusiastically endorsed by the United States government. "What about the good Injuns?" 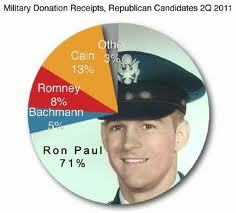 someone is said to have inquired of General Sheridan, "Do we kill them too?" "The only good Injun I ever saw," answered the General, "was dead." Mormon teachings, of course, were diametrically opposed to this way of thinking. In the words of Bruce Porter, "Joseph Smith claimed that the Native Americans were, in fact, just like the rest of us: Just as good, just as valuable, and just as important as all of the rest of us." 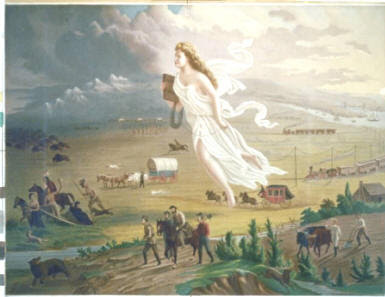 The spirit of Manifest Destiny pushing the unwanted Indians off her precious land. But by the time this rebranding of American Exceptionalism was taking hold, Joseph Smith was long dead, and few Americans would have been swayed by his arguments. To those adopting this revamping of American purpose, it was essential to view the red man as subhuman, with none of the rights God's grace bestowed on whites. Shane Mountjoy, author of Manifest Destiny, explains the reason for the shift. "19th century Americans would have found it more than inconvenient," he says, "Politically it would have been impossible for them to have taken lands away from any indigenous peoples if they viewed them as having rights even close to what they had as American citizens." But Wayne May introduces a bit of a dilemma. "As archaeology developed as a new science, and anthropology as a new science, they would find these things, these evidences to show that there was a written language, that these people possibly did smelt iron, they did smelt copper and they mined it; they carried it in trade over great distances. These were signs of a higher civilization. And that higher civilization idea coming from our scientific community of the day came into direct conflict with the manifest destiny ideas put forth by the U.S. government." In other words, nothing historical that predates the white man counts. Such things are henceforth not to be discussed in polite scientific circles. For all intents and purposes, all discoveries linking the Indians to a civilized past ceased to exist. The red man is a savage, and always has been; that was official United States policy, backed up by a declaration from the Smithsonian's own Grand Poobah. But what about those hundreds of scrolls that proved Indians once had a written language? Artifacts, statues, and stone tablets? "Native Americans even today suffer from this policy, which effectively meant that Native Americans have no history...You only have a history if it's something written down. If you have an oral tradition, that doesn't count as history." What seems to have bothered Powell most about those pictographs is that some of them contained symbols which strongly resembled characters in ancient Hebrew and Egyptian hieroglyphs. 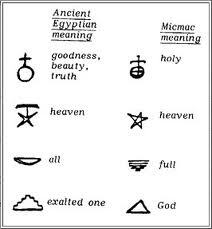 Similarities between the East coast M'ik Maq hierglyphs and those of ancient Egyptian are particularly striking, because not only are the symbols similar, but the translations are eerily close as well. If these scrolls were to be closely scrutinized and scientists were to announce those discoveries, it might suggest that, as some Americans had been proposing, American Indians were actually descended from old world stock and the case could be made that the red man had the same rights and privileges as the European settlers. A good many Americans claimed either English or Scots-Irish ancestry, and it was widely understood in those days that Albion's seed were descended from the house of Israel through Ephraim. If it were to become widely accepted that the Indians were also sons of Abraham, the jig would be up. There would be no more lording it over the Indian, no matter how savage his present ways. So all those pictographs were crated up and carted down to the sub-sub-basement of the Smithsonian and also left abandoned in the nooks and crannies of other museum basements across America. It doesn't take long for things like this to vanish from history. All it takes is for the ones who boxed the stuff up to die off, then there's no one left to remember. You don't have to be a Mormon to notice anthropological similarities between the cultures of the Hopewell Indians and the middle east. 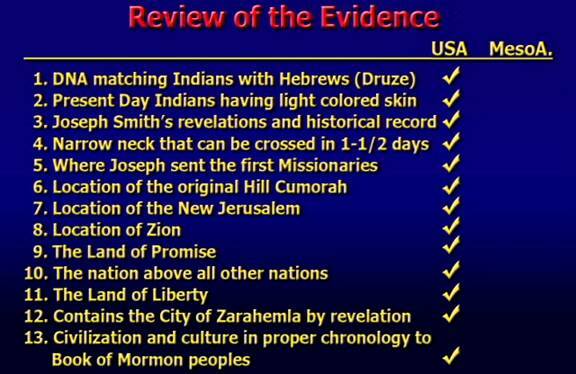 There are a whole bunch of scholars and amateur archaeologists who have no interest in the Book of Mormon, yet surmise from the available evidence that ancient Native Americans such as the Hopewell civilization might have traded, intermingled, or even originated from other cultures. These scholars are known as Diffusionists, and their theories are as varied as those of other disciplines. Some are convinced that these connections were the result of trade between ancient Americans and the seagoing Phoenicians, while others propose other theories. What they have in common is the belief that contact between the Americas and other geographies may have taken place before Columbus. It should be noted that Professor Bolnick, being the pure scientist that she is, has not been happy with the way some religionists have promoted her comments to support their own religious theories (such as I'm doing here). Since appearing in this documentary she has signed a letter distancing herself from some of the conclusions arrived at by the filmmaker. That's fine. I think her words speak for themselves. Besides, I don't see that the makers of Lost Civilizations of North America have put forth any particular religious view whatsoever. If you're looking for a compelling step-by-step presentation of the evidence for Hebrew-based civilizations on the North American continent geared specifically to latter-day Saints, you'll want to check out the website of the FIRM Foundation. I've just finished watching their five disc Book of Mormon Evidence Series and I'm happy to announce that my love affair with the temples at Teotihuacan is officially over. What were we thinking, anyway, always featuring that architecture in our media as though a site widely believed to have been used for human sacrifices was somehow indicative of Nephite culture? Meldrum and other researchers have been quite thorough in exploring every imaginable facet of the possibility of a North American setting for the Book of Mormon, and I am convinced they're onto something here. Many of us who have long bought into the Meso-American view have done so because that appeared to be the only game in town. Still, believing that Book of Mormon events took place in Central and South America required a lot of mental acrobatics, not the least of which was the presumption that there must have been two Hill Cumorahs. Since that final Book of Mormon battle "obviously" took place in South America and the plates were discovered in New York, the theory went, the main hill Cumorah was somewhere in Meso-America near where the final battle took place, afterwhich Moroni schlepped the gold plates all the way up the hemisphere to upstate New York and buried them in a hill he named after that other hill back home. Like I say, making all that fit required some suspension of belief. Like assuming the Isthmus of Panama was the location for the narrow neck of land. That area might look narrow to us on a map, but to the people living there it feels anything but narrow. I lived for three years on the island of Oahu, and although I knew it was an Island, it never seemed like one to those of us who lived there. The Book of Mormon describes the narrow neck of land as capable of being crossed by foot in a day and a half. That fits the location Meldrum shows us near the Great Lakes much better than the Central American version, and makes a lot more sense. E.G. Squire was one of those 19th century Americans who spent his life painstakingly describing and recording those many archaeological anomalies. In one of his books published in 1851, Antiquities of the State of New York , Squire described how locals uncovered huge mass graves containing thousands of skeletons of men, women, and children seemingly tossed indiscriminately into those pits. The bones crumbled at the slightest touch. These huge bone pits were located in Western New York, right where you would expect them to be in relation to the hill Cumorah. As for the whereabouts of all those weapons? Don't make me have to explain the obvious. As recently as my own childhood it was still a popular pastime for boys to go out into the woods to hunt for arrowheads. The pickings were getting thinner by then, but it used to be that no matter what part of the country you lived in, arrowheads and spear points were plentiful virtually everywhere, usually just inches under the dirt, and often just lying on the ground. It was like collecting rocks. By the way, you would think that after providing answers to the most persistently perplexing questions on Book of Mormon geography, those scholars who have spent their careers performing mental acrobatics trying to force that awkward Central American theory to fit into what we read in the Book of Mormon itself would be standing in line to thank Meldrum and his fellow researchers for their thorough and exhausting labors in bringing this research to light. You would think that, wouldn't you? People who have spent their entire careers trying to bring others to their way of thinking are not easily persuaded to let go of their fixed beliefs. Many of the very people you would expect to see a lightbulb of recognition go off in their heads when they see Meldrum's presentation are the very ones who have reacted dismissively. Many people are confused by the term "apologetics" when used in a religious sense. They think it implies the apologist is somehow expressing remorse. But the word, derived from the greek "apologia" simply means defending one's position, to explain and clarify and to correct misconceptions outsiders might have about you. A Christian apologist in the first century A.D., for instance, might want to clarify rumors that Christians were cannibals whose sacrament involved eating the flesh of other people as a tribute to their god. "That's not quite accurate," the apologist might patiently explain, "We don't eat human flesh. We ingest bread and wine just like you do; the difference being that during our sacrament we consider those things to be symbolic of God, in that as the bread and wine are taken into the body to become part of us, so too do Christians absorb the spirit of God so that they may always have His spirit to be with them." In the past, anti-Mormons such as Ed Decker have claimed that Mormonism is a satanic religion and one of the proofs is that LDS chapels have spires on the roofs rather than crosses so that when Jesus returns we hope to impale him on those spires. In response to such an accusation, a Mormon apologist would patiently explain, "No we don't, and you're an idiot." I love Mormon apologetics. Before the internet, my absolute hands-down favorite Christmas present to myself was the annual F.A.R.M.S Review of Books. (F.A.R.M.S. stood for the Foundation for Ancient Research and Mormon Studies; a few years ago when I wasn't looking, F.A.R.M.S morphed into the less acronymic Neal A. Maxwell Institute For Religious Studies.) My all-time favorite F.A.R.M.S. reviewer was Daniel C. Peterson, the director of that institute. Peterson, a professor of Islamic and Arabic Studies and expert in near eastern languages, had an envious ability to turn a phrase just right and wield an argument that put his opponent in his place. I always read his stuff first. Peterson is a top-notch scholar with a delightfully dry sense of humor. With the advent of the internet appeared another group of Mormon apologists under the name FAIR, which I confess to not being very familiar with. In recent years I've spent less of my time with Mormon apologetics because I've noticed a subtle backing away from academic honesty in some apologetic writings. Rather than explaining and clarifying Mormonism, some modern apologists can be found engaging in the same circular reasoning and academic dishonesty they had been accusing Mormon critics of. It's become more and more apparent to me, that rather than explaining and defending the faith, a good deal of Mormon Apologetics exists today for the purpose of defending the image of the corporate Church, and often through the use of weaselly methods. When Rod Meldrum appeared on the scene with his compelling arguments against a Meso-American setting for the Book of Mormon, he was challenging the status quo. Many of the same people who make up the Mormon apologetics community have been the ones most vigorously defending the Meso-American setting. As Meldrum has pointed out, millions of dollars have been wasted on archaeological digs in South America, and some of those millions wasted were through projects financed by the Maxwell Institute, BYU, and the LDS Church itself. Writers for the Maxwell Institute have published numerous books and conducted church members on expensive tours of "Book of Mormon Lands" in South America. Rod Meldrum was stepping on some very big toes. It is telling that the longest response to Rod Meldrum's thesis that I can find online does not address or refute any of the numerous evidences evident in Meldrum's video presentations, but instead focuses on an early 169 page booklet Meldrum issued on the subject of DNA research. Even that attack is largely lacking substance, chipping away petulantly at the edges of the argument rather than refuting the basic premise. The author, Gregory smith, seems alarmed at the influence Meldrum is having among the rank and file of the church, and he expends quite a bit of space reprinting many of the glowing testimonials from members who have attended Meldrum's seminars, lamenting their enthusiasm for the understanding they've gained. Smith is particularly mocking and dismissive of statements Meldrum has made to the effect that he has felt inspired to engage in this research. Well, why shouldn't Meldrum feel inspired? Smith reports on Meldrum's "inspiration" as though it is something members should be wary of; as though Meldrum had claimed to have seen a vision in a grove of trees and was in danger of leading the flock away to Voree. Heck, I was inspired to start this blog a couple of years ago, but that doesn't mean I conversed with the Father and the Son beforehand or that I intend to go off and start my own church. In case Smith has forgotten, we lowly, unprivileged members of the church are commanded to seek inspiration in all that we do, just like the big boys. So there we have it. Truth, even when based on solid archaeological evidence, is suspect if not disseminated through the proper priesthood channels. "Inspiration" is apparently now the province only of the top Church Administrators. Lowly, unaccredited mere members are not entitled to share their discoveries or their opinions. We should all be in favor of being exposed to new information whether it comes to us from a Mormon or a Buddhist, from a Republican or a Democrat, from a pauper or a king. At the beginning of each of Rod Meldrum's Evidences DVDs, he is careful to include a disclaimer that the information contained therein does not represent the views of the Church of Jesus Christ of Latter-day Saints. The Church(TM), does not take a position on where events described in the Book of Mormon may or may not have taken place. The Brethren, we are constantly reminded, simply do not know. Here's my question: Why not? Why don't they know? Aren't these guys supposed to have a direct line to God himself? Why doesn't somebody just ask Him? I can understand a reluctance to pinpoint the precise location of certain cities and battle sites. But are we to believe that the modern prophet of God can't even claim knowledge of the proper end of the hemisphere? Why is everyone so comfortable with the answer that "we just don't know"? I'll tell you who did know. Joseph Smith knew. On numerous occasions he pointed out specific locations where he was very definite about his claims where Book of Mormon events took place. And that's not counting all the clear scriptural references. All of these locations were clearly declared to be in the interior of what is now the united states. Never did Joseph so much as hint that any of the people or events described in the Book of Mormon ever occurred south of the border. I think what irks guys like Gregory Smith more than anything is when Meldrum engages in some informed speculation. Meldrum is careful to point out that he doesn't know for certain, but based on some very compelling scriptural and geographic detective work that is too complicated to go into here, he makes a very good case that the city of Zarahemla may very well have been located across the river from what later became Nauvoo. If that's even remotely true, it gives me one more reason to kick myself. Missionaries are not allowed to leave their mission boundaries, certainly never to go into another mission, and at one point during my mission a companion and I found ourselves standing on the Iowa side of the Mississippi river, looking wistfully over at Nauvoo which we could clearly see. We desperately wanted to visit Nauvoo, but Nauvoo was the headquarters of its own mission, crawling with missionaries of its own -not to mention somewhere over there was the Nauvoo mission president. If we had dared to sneak over, we knew that even dressed in our grubbies we would have been spotted as fellow missionaries gone AWOL, been sent home in ignominy, and probably excommunicated. It was fear of such consequences that kept us in check. But here's the thing. If Rod Meldrum is even close in his estimate -and I believe he is- not only did I miss my chance to stand on historic ground in Cahokia, but it's entirely possible that while I was wishing I could be across the river with my feet planted firmly in the city of old Nauvoo, I was very likely standing on the actual site of the city of Zara-Fetching-Hemla itself, and not appreciating the irony one whit.